Secure Ripping is a process of obtaining best possible results when ripping audio CDs, scratches and other damage to audio CDs can effect reading. A secure ripper can recover errors to an extent, but some CDs are beyond help regardless of which program or CD drive is used. There are two areas a secure ripper has to perform well, detecting and recovering errors as well as informing when an error cannot be recovered - the last thing you need is a Ripper which indicates a rip was error free when in fact there are errors. Read more about dBpoweramp Reference's CD Ripping Features. Illustrate has researched secure ripping over a period of many months, literally ripping 1000's of CDs. 10 different CD drives were purchased especially for this task, each had an attribute which was needed for testing (cache / no cache, c2 different support), quality drives and not so good drives were tested. Over the course of testing it became obvious where certain drives let errors slip though the net with a simple read, re-read & compare strategy, a new method of ripping was required. There are 3 ways to detect errors, the first method and strongest is by AccurateRip, it compares your CD to somebody else’s CD ripped on different hardware. This method has strength and weakness - the strength is if AccurateRip says your rip is accurate with a confidence of 5, you better believe it (see below for technical details on AccurateRip), its weakness is if your CD is not in the database then AccurateRip cannot help you. The next method is the rip-rerip way, the idea is if there is a scratch the re-rip might get a different result so that area of the CD can be ripped many times until there are matches. EAC pioneered this method (the work of PlexTools and dBpoweramp are based on EACs work, we stand on the shoulders of giants, or a giant). This method is to be really put to the test and highlights dBpoweramp’s new way of doing it. Finally there are C2 Error pointers, in a simplistic form think of them as flag after a CRC check on the data. Also know that some drives do not support C2 pointers, whilst other drives do not detect all errors with C2 (because of poor firmware). Important point: no matter how good a C2 implementation is on any drive, errors can still sneak through - lets suppose that on a particular drive C2 error pointers can detect 999,999 out of 1,000,000 errors - sounds good odds, I am sure my CD is not that one in a million, I am 100% confident in C2 pointers. WRONG, a scratched CD might have 1,000 frames with problems (which test C2), so the chance of an error getting through on that CD is 1,000,000 / 1,000 = 1:1000 chance of the error getting through. How many CDs are ripped each week? Possibly 10 million (going off freedb disc connects). Of those 100 million tracks many errors would get past C2. Don't take this as an attack on C2, they help but should not be relied upon 100% solely - if supported switch support for them on. Overtime AccurateRip can become like a wise-friend, someone you can rely on and trust. It works by storing peoples ripping results and comparing your result with theirs. For example 100 people rip Madonnas latest CD, of those 100 twenty have errors, the other 80 all have identical rips. If you were to rip your Madonna CD there are 2 possibilities, AccurateRip would report that 80 other people agree with your rip (confidence of 80), or that 80 disagree if your had errors. What are the odds of 80 people agreeing with your rip, but they really had a bad rip (ie those 80 people had bad rips which happened to give the same check code)? the odds are 4 billion x 4 billion (repeated 80 times), an astronomical number. If more than 3 people agree with your rip, it is 100% certainty it is accurate. Ripping and re-ripping the same sector continuously causes a drive head stress (it is jiggling back and forward), the head is less stressed if it moves in one continuous direction. Consider this analogy, sit on an office chair whilst someone quickly jiggles it back and forward, then sit there whilst it is moved slowly from one side of the room to the other, which is more headbanging stressful? Multiple burst passes cause little stress to a drive. A single CD in our collection proved to invaluable when testing drives and ripping software: Dido - No Angel, it is in AccurateRip with a high confidence (19), so simplifies testing, if AccurateRip says tracks are inaccurate they are regardless of what the ripping program says. This CD has many scratches, but not overly damaged - certain tracks are known not to be recoverable. As part of our testing many other CDs were ripped, batches of artificially damaged & black marker pen damaged CDs, for clarity results from 1 CD and a selection of drives are presented here. EAC - v.95 beta 4. Secure mode & high error recovery quality, allow speed reduction during extraction, caches set when cache detected. dBpoweramp R12: Secure Mode: Pass 1 AccurateRip Verified, Pass 2: Maximum Drive Ripping Speed, Ultra Secure Mode (min 6, max 10 finish after 2 clear passes), Pass 3: Maximum re-reads 48, Drive Speed Maximum. If C2 was enabled then Ultra Secure was set to 1 minimum pass to verify the C2 result (maximum re-reads was 700). All drives tested support Accurate Stream. We will let the results speak for themselves, tracks without errors are best, next are tracks with errors (and errors reported), finally if a rip had errors but was not reported as such that is the worst a ripper can do. Plextools Pro relies 100% on C2 error pointers reporting the errors, whilst on a drive with a good C2 error pointer implementation a very high % of errors are detected, a small percentage do slip through undetected. EAC with C2 error detection on uses C2 pointers to detect errors, when an error is found C2 error pointers are not used, that is why on the above tests (with C2) EAC reported no errors on certain tests where C2 error pointers could have prevented that. Without C2 error pointers EAC rips, then re-rips and compares - should an error be duplicated in both reads it will pass through undetected. dBpoweramp's method is quite a bit different to the traditional Ripping methods, using a concept of complete passes to identify errors and put less physical stress on the drive. With C2 error pointers an optional ultra pass can be used to identify errors which slip through the C2 net (no matter how well C2 is supported on a drive). The re-rip code on identified bad frames is pretty standard except we also implemented routines to try to detect interpolation many drives do when there is an error. 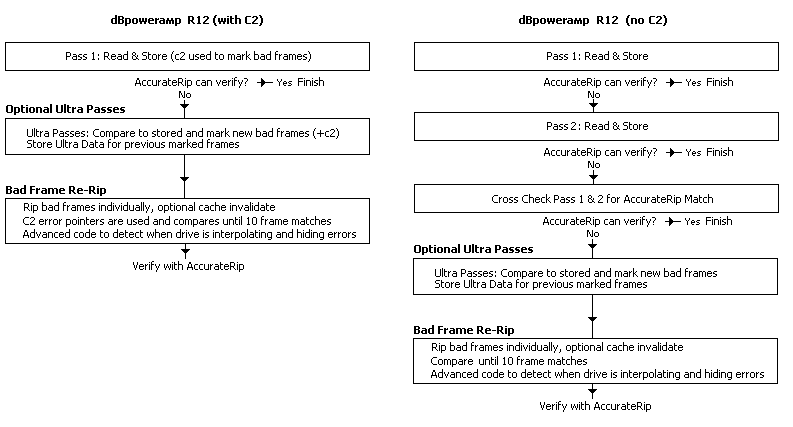 With no C2, there are always 2 passes after which a cross-check is done against AccurateRip to determine if elements in each of the pass were correct. Ultra passes are useful in detecting errors when C2 error pointers are not supported, the Matshita drive especially needed the extra passes to detect errors (sometimes detecting new errors 6 passes in). This drive caches, the cache can be cleared in EAC with -usefua, and through the FUA option in dBpoweramp. This Plextor was quite impressive at ripping the results are very good. Out of all the drives tested this Plextor ripped the best, not much work was required by EAC or dBpoweramp. Remarks: EAC when not using C2 (on tracks 5, 8 + 9) showed error bars right at end of ripping track, where I am quite sure there were no real errors. This drive does not cache or support C2 error pointers. This drive supports C2 and does not cache. Track 3 + 7 could not be ripped (10,000 bad frames per track), so will be excluded.